"Muddy and The Wolf". This is the album that introduced me to the work of legendary blues men Howlin' Wolf and Muddy Waters a long time ago, and one that I still have a sentimental attachment to to this day. The title is a little misleading. The first half is tracks taken from Muddy Water's album "Father and Sons" and the second half from Howlin' Wolf's "The London Howlin' Wolf Sessions". Both of these were originally released in the early 1970's. 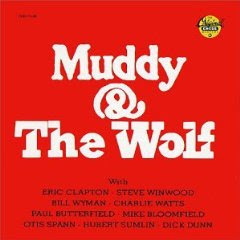 "Muddy and the Wolf" features some of the two's strongest electric material from the 1970's, and is an excellent place for both the uninitiated to start and for the die hard fan to enjoy. Howlin' Wolf's material is especially unique as he is performing with Eric Clapton, Steve Winwood, and Bill Wyman (bassist for The Rolling Stones) backing him. This is not an overview of the two's career, but a great snapshot of their impressive sound at that time. Here's Muddy Waters' "All Aboard" and Howlin' Wolf's "Who's Been Talking?'' Enjoy. Labels: All Aboard, Bill Wyman, blues, Eric Clapton, Howlin' Wolf, Muddy and the Wolf, Muddy Waters, Steve Winwood, Who's Been Talking?